I never imagined how much I would love the sight of a group of preschoolers dancing their hearts out to Charlie Parker playing “A Night in Tunisia.” It was beautiful! Their limbs were wiggling, their feet were moving and the smiles were broad. Storytime began, not with Charlie Parker, but with a fun literacy movement activity featuring our new Twist and Spell cards. I had one set (26 letters) in a dark bag and had kids pull one from the bag to present to the group. As the card was pulled I (or a child) said the name of the letter pictured on the card and then held it in front of the group. Together we mimicked the child’s body and formed the alphabet letter as I repeated the name and the sound of the letter. Children called out words they knew with that letter, pointed to their storytime mat if featured the letter or enthusiastically called out their name if they knew it included the letter. There were about 12 kids at storytime which turned out to be the perfect number of movements before we moved on to our stories. Ending with Q, and making our bodies into human pretzels, was good for our bodies! We wiggled our hips, tapped our feet, waved to my coworker who just happened to be in the children’s library, waved to our moms, waved to a dad, and then sat down (and then up again according to the direction on the scale I played on the slid whistle). 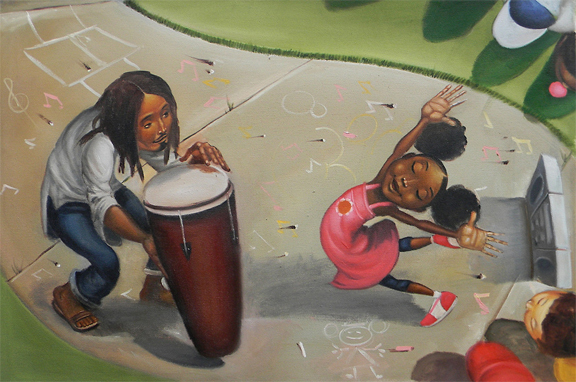 This is a beautifully illustrated look at a young girl’s urban community and the rhythmic joy she finds in her daily routines. It is a book perfect for storytime because kids get to move to the onomatopoeic text along with the book’s star, a young girl full of infectious joy that the author named Miraculous. Giraffe is gangly, awkward animal who believes he can’t dance until a cricket encourages him to find his own rhythm. Giraffe embraces his new grace and dances his way into the annual jungle dance where he amazes his animal friends. 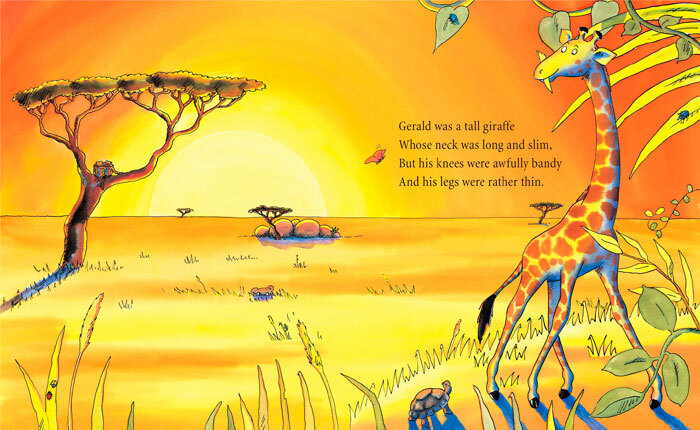 Kids enjoy the colorful pages, the familiar animals and of course dancing like a giraffe. With this book there are lots of opportunities to talk about jungle ecosystems, various animals, and what giraffes might use their long gangly-looking legs for (animal adaptations). We need to move again! 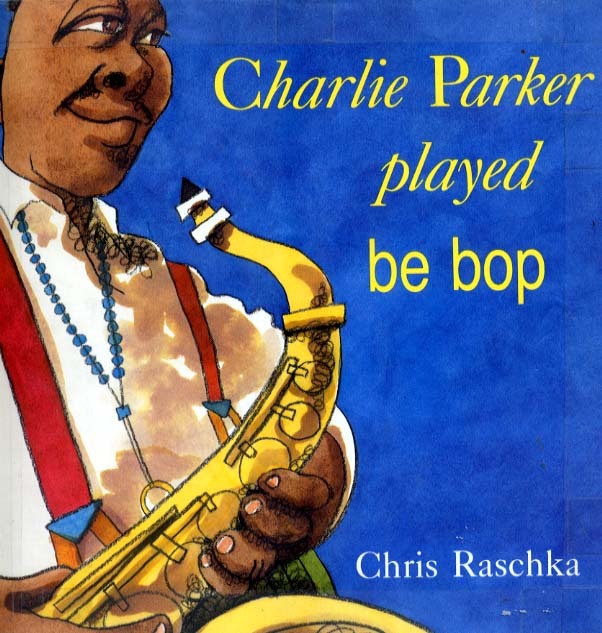 Before we read our last book together, I told kids a little about Charlie Parker, the famous saxophone player. 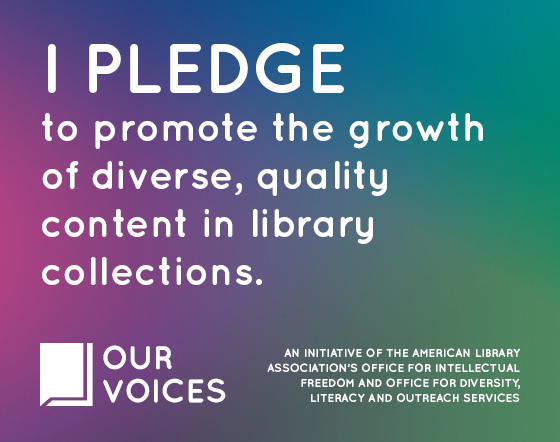 If you need resources, visit talkingbooks.net. There you’ll find interviews with the author/illustrator and lesson plans. I also explained a little about the book and then a little about the song the book is based on, “A Night in Tunisia.” To get kids in the mood, I then played a recording of the song performed by Charlie Parker, Dizzy Gillespie, and Charlie Mingus (using my phone and a portable speaker). I imagined that I would just play a bit of the song, incorrectly anticipating that the kids would not know without prescribed actions. I was so wrong! As I played the song, kids free danced for the whole length of the recording. Never underestimate a child’s love of music. This book expresses the sound of Charlie Parker playing the saxophone in words in the form of a sound poem. It needs an animated reading and the kids appreciated how Raschka played with the words. What word can you use to describe different sounds? For this storytime, I offered kids two choices. One choice was to play with a variety of instruments I’ve used in the past for a Sound and Music Storytime. This was everyone’s first choice and storytime quickly turned into a jam session! Like Ashley over at the Loudest Librarian who included Raschka’s book in a music storytime, I love the song “Little Liza Jane” by Elizabeth Mitchell so I turned the song on and let the kids play their hearts out. The other activity was a simple craft. I had materials out for kids to make their own paper plate shakers. Not a particularly novel idea, but the families loved its ease and the end product was played all the way out the door. I played a variety of music from my storytime playlist while the families worked on their shakers. Fold plate in half. Add approximately 1/2 cup beans and/or rice to the inside of the plate. Beans will make a deeper sound than the rice. Put a bead of glue on the rim of one side of the plate (which will stick to the other side when folded shut). Staple the two edges of the plate together, enclosing the beans/rice inside. Decorate the outside. There is a “Between the Lions” episode featuring “Charlie Parker Played Be Bop.” It’s amazing. It could probably be used on an iPad if you wanted to interject visual media in your program. Super cool program! What a great idea! I’ll check it out. Thanks Michelle!